The Eagle Forum confirmed on Monday that its founder, conservative icon Phyllis Schlafly, had passed away at age 92. Schlafly founded the Eagle Forum back in 1972 — it was born out of her campaign to defeat the Equal Rights Amendment — and the organization describes itself as being conservative and "pro-family." But though she was reportedly still president of the Eagle Forum at the time of her death, Schlafly's endorsement of Donald Trump earlier this year was controversial among conservatives, and generated infighting among Eagle Forum leadership. Back in March, Schlafly endorsed Trump at a rally for the Republican nominee, The Washington Post reported. She said she thought Trump would bring about a victory for conservatives come November. I think he has the courage and the energy — you know you have to have energy for that job — in order to bring some changes. To do what the grass roots want him to do because this is a grass-roots uprising. We've been following the losers for so long — now we've got a guy who's going to lead us to victory. Texas Sen. Ted Cruz, who ran against Trump during the Republican primaries, frequently praised Schlafly's brand of conservatism. 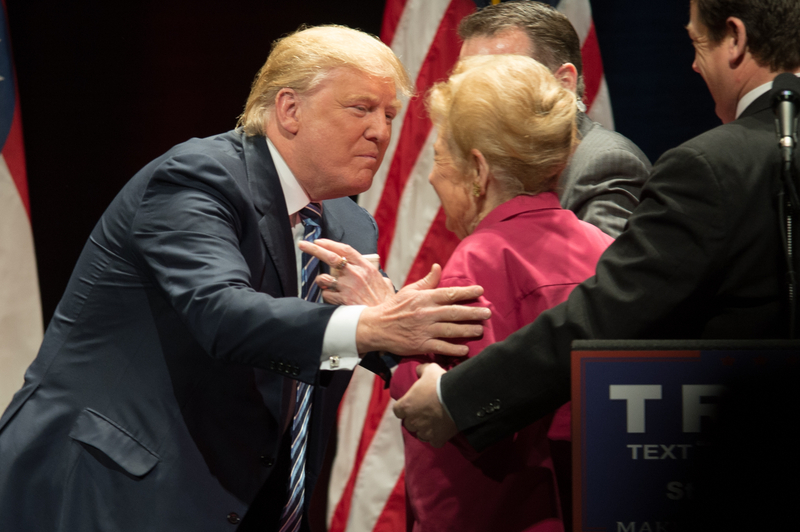 But while she argued that Cruz was "eminently qualified" to be a Supreme Court justice, Schlafly turned her support to Trump in the presidential race, and lauded him for his proposals about deportations and banning Muslims from entering the country. A month after Schlafly had endorsed Trump, however, The Washington Post reported that she was confronted with an attempt to oust her from the Eagle Forum, her own organization. In April, Schlafly sent a statement to reporters in which she gave an account of how the "Gang of 6" — a group of Eagle Forum board members, including Schlafly's daughter Anne Cori — was allegedly plotting to fire her. At 2 p.m. today, six directors of Eagle Forum met in an improper, unprecedented telephone meeting. I objected to the meeting and at 2:11pm, I was muted from the call. The meeting was invalid under the bylaws but the attendees purported to pass several motions to wrest control of the organization from me. They are attempting to seize access to our bank accounts, to terminate employees, and to install members of their own Gang of 6 to control the bank accounts and all of Eagle Forum. Schlafly and the six board members went to court over the situation, Christian news website WND reported. Anne Cori never commented on the allegations, saying only that the judge had asked them to refrain from making statements. Though it wasn't the first time Schlafly faced criticism for her support of Trump, it was perhaps the most dramatic. Her endorsement of Trump marked a split from many Eagle Forum members who had previously endorsed Cruz. One of them — Cathie Adams of the organization's Texas chapter — claimed that Schlafly's age had resulted in her being manipulated to lend her support to the business mogul, a claim the Eagle Forum president called "disparag[ing]" and "insult[ing]". In a statement released Monday night, Trump remembered Schlafly for being "a conservative icon who led millions to action, reshaped the conservative movement, and fearlessly battled globalism and the 'kingmakers' on behalf of America's workers and families." He added that her support for his campaign symbolized "one more great battle for national sovereignty," and referred to her as "a patriot, a champion for women, and a symbol of strength." While Schlafly's support for the Republican nominee resulted in criticism from her own Eagle Forum, her family, as well as from mainstream conservatives, she has certainly left behind a legacy of right-wing political engagement.